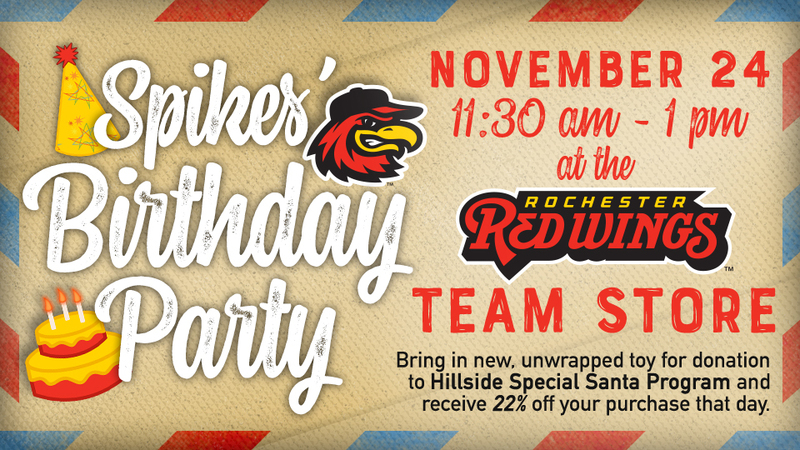 Come celebrate Spikes' 22nd birthday with us from 11:30 am - 1 pm on Saturday, November 24 at the Red Wings Team Store. In lieu of a present for Spikes, we ask that fans bring in a new, unwrapped toy to be donated to the *Hillside Special Santa Program if they wish. Each family who donates a toy will receive a coupon for 22% off at the Team Store. The coupon will only be valid on Saturday, November 24. At the party there will be a station set up for kids who would like to make a card for Spikes and get their picture taken with the Birthday Bird. At 12:30 we will sing Happy Birthday and serve up FREE cake! If weather permits, our bounce house and speed pitch inflatables will be set up in the concourse just outside the store for kids to play with. We look forward to seeing many of you at the party. You do NOT have to RSVP.